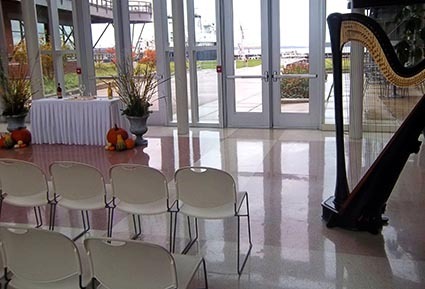 Devon Carpenter, harpist, is a professional Quad Cities harp player providing music for events in Cambridge, Kewanee, & Geneseo, IL, and the surrounding areas. The elegant music of the harp is the perfect addition to your wedding ceremony, reception, or party. Also available as a harpist for weddings and events in the neighboring areas of Bureau County, Knox County (Galesburg), Mercer County, Rock Island County (Moline & Rock Island), Stark County, & Whiteside County (Sterling & Morrison), Illinois, and Scott County (Davenport & Bettendorf), Iowa.